Mason PEAKS and Mason MINTS were confectionery products made by the Mason, Au & Magenheimer Confectionery Mfg. Co. in this building at 22 Henry St., Brooklyn. Mason Peaks was a candy bar (bar shaped) with coconut covered in chocolate. A Mason Mint was a round, chocolate-covered mint patty. Mason also made Dots and Crows which are now (2002) owned by Tootsie Roll. The company was founded as Mason & Au, confectioners, 81 Fulton St., Brooklyn in 1864. The founders were Joseph Mason and Ernest von Au. By 1880 Mason and Au were joined by Emil Zollinger, and the name changed to Mason, Au & Zollinger. The 1880 U. S. Census (non-population schedules) recorded Mason, Au & Zolinger, Candies as owning capital worth $110,000 and raw materials worth $104,000. They employed 35 workmen who were paid at a daily rate of $3.50 for skilled hands and $1.50 for ordinary laborers. The company paid total annual wages of $15,416. The value of the past year's production came to $150,000. In 1884 the "principals" were Au, Zollinger and Louis Magenheimer. In 1892 the company moved to the corner of Henry and Middagh as Mason, Au & Magenheimer, confectioners. The officers in 1933 were Charles F. Haug, pres., Frederick A. Magenheimer, vice-pres., treas., and Herbert E. Haug, sec. Mason, Au & Magenheimer remained in business at 22 Henry St. until 1949. At that time they re-located to Mineola (later 150 Old Country Road, Carle Place), Long Island. The business was sold in the 1960's to Bayuk Cigar, then to the Candy Corporation of America, and then later to Tootsie Roll which continues (as of June 2010) to make the Mason Dots and Crows. A beautiful photograph of the building at 20 Henry St. appeared on the cover of a real estate advertising supplement in the New York Times, Saturday, 17 Sept. 2011. 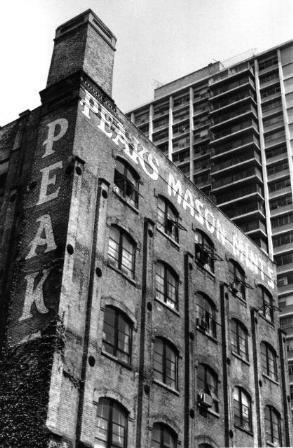 The building was described as "the 19th-century former Peaks Mason Mints building." However, the sign in the photograph seems to have been repainted, (although this may have been only an artist's retouching on the photo). It is always a mistake to repaint a vintage sign.